This series was originally published at the Redbird Daily, but is now proud to call Cards Conclave home. This installment was written by Allen Medlock. The latest submission in our Top 100 St. Louis Cardinals contain a masher with a personal seating section, a classic example of a crafty left-hander, the epitome of a power closer, maybe the most underappreciated first baseman in history and another in the line of Cardinals in the Baseball Hall of Fame. Let’s get it started with a player that was won over by Cardinals fans and decided to stay around town for a while. How fitting that Big Mac lands at #25. Acquired at the trade deadline in 1997 in what was perceived as a short-term rental for a California kid looking to return to the west coast, Mark McGwire went on to hit 24 home runs in the 51 games played during the team;s second half. He won over fans with his power and was won over by fans with their passion for the Cardinals. In 1998 McGwire put on a historic display of home runs, ultimately passing the single-season record of 61 hit by Roger Maris in 1961. The chase became a worldwide must-see event as McGwire and Sammy Sosa both chased the record throughout the summer. McGwire would go on to pass Maris and ultimately end up with a then-record 70 home runs, a number that continue to resonate throughout Cardinal fandom even today. 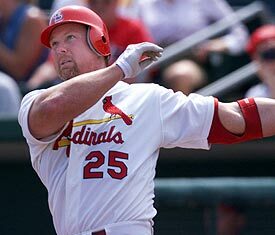 In his four full seasons as a Cardinal, McGwire was a three-time all-star and silver slugger award winner. After a stint as the Cardinals hitting coach, McGwire left to take a job in Los Angeles. McGwire was enshrined in the Cardinal Hall of Fame this past summer. Chick Hafey was signed to pitch for the Cardinals out of high school but converted to the outfield in the new farm system established by Branch Rickey. Hafey was considered the most successful player to come out of that system. A member of two World Series championship teams in 1926 and 1931, he led the league in hitting in the ’31 season. The veterans committee voted in Hafey as part of the 1971 Hall of Fame class. The 1985 season started poorly for the new Cardinal John Tudor. A record of 1-7 left Tudor scratching his head and looking for answers. In one of his televised starts, a former teammate noticed a slight mechanical issue and relayed the message to Tudor. The rest is history as Tudor would go on to win 21 regular season games and 3 more wins in the postseason as the Cardinal were once again National League pennant winners. Tudor pitched ten shutouts that 1985 season and is currently the last pitcher with multiple shutouts in one season. A controversial ending to popular Cardinal career has muddied the perception fans have of Keith Hernandez. Arguably the best first baseman in the league throughout his nine years as a Cardinal, Hernandez won five Gold Gloves and the National League Most Valuable Player in 1979. Hernandez hit a league-leading 48 doubles and won the league batting title with a .344 average while scoring a league-best 116 runs in the MVP season. Notable disagreements with Whitey Herzog forced the Cardinals to trade Hernandez during the summer of 1983. At this point, Hernandez had been implicated in the Pittsburgh drug trials and was seen as a clubhouse cancer. Hernandez admits his drug abuse ultimately lead to his departure from the Cardinals. The Cardinals Hall of Fame committee has submitted Hernandez’s name for an election which I believe should happen eventually. Making his big-league debut in 1985 during a pennant chase, Todd Worrell was immediately given the closer role. He wound up saving five games down the stretch and another during the 1985 World Series. The highlight of that series was a low-light for Cardinal fans as Don Denkinger missed Worrell’s foot on first base, a call that likely would have won the series for the Cardinals. Worrell would win the National League Rookie of the Year and the Rolaids Relief Man of the Year in 1986 after saving a league-best 36 saves. Worrell would follow-up with two more 30 plus saves seasons in 1987 and 1988. The 1987 Cardinals would again win the National League pennant with Worrell saving three more postseason games. Thank you again for reading. Colin will have an addition to the list tomorrow.